Every roofing installation job comes with its own unique challenges. However, some are stranger than others! Got a weird, unique or complicated roof? Building a roof with a weird or unique shape offers unique problems. Roof angles, out-there shapes and curves can test architects, engineers and roof installers alike. Luckily for you, one of the (many) benefits of metal roofing installation is that it’s the perfect choice for weird, unconventional and complicated roofing jobs. You’d think flat roofing would be easy to instal, right? Unfortunately, that’s wrong – in fact, flat roofs can be just as challenging, just in different ways! The big challenge with flat roofs is drainage. Water that gets into your roof cavity can cause mould, water damage, staining or worse, hence getting water off your roof is a prime concern. The problem with tiles is that, well, they aren’t watertight. Look at your typical tiled roof. If you notice that where tiles meet, there’s a bit of a gap. This isn’t normally a problem – tiles have enough of an overhang to stop water from getting in. With a flat roofing though? That’s a completely different story. Luckily, metal roofing comes in sheets. When properly installed, these interlocking sheets are watertight, preventing any water from getting in. Thanks to its flexibility (literally), metal roofing is the ideal – and often, only – option for curved roofs. That’s because in many cases, it’s impossible to bend or wrap a tiled roof to fit around curves or bends. We’re not engineers, but we have worked on our fair share of roofs. Your roof will be fighting against gravity to stay up, and oftentimes, excess weight can stress a curved roof to the point of collapse. Why is metal roofing the best choice? Roofs with extreme slopes, curves or shapes are problematic, as they’ll have to fight against gravity too. This puts extra strain on your roof – especially the areas that hold the entire thing together. For an example, look no further than Southern Cross Station. Remember back in 2010 when storms caused the roof to buckle? That’s because pools of water and hail put extra weight, stressing out the roof until it collapsed. Luckily, the measures were put into place to prevent a repeat. It’s also a perfect example of why going with a heavier materials such as tile is simply out of the question! Luckily, metal roofing is the lightest of the commonly-used roofing materials. 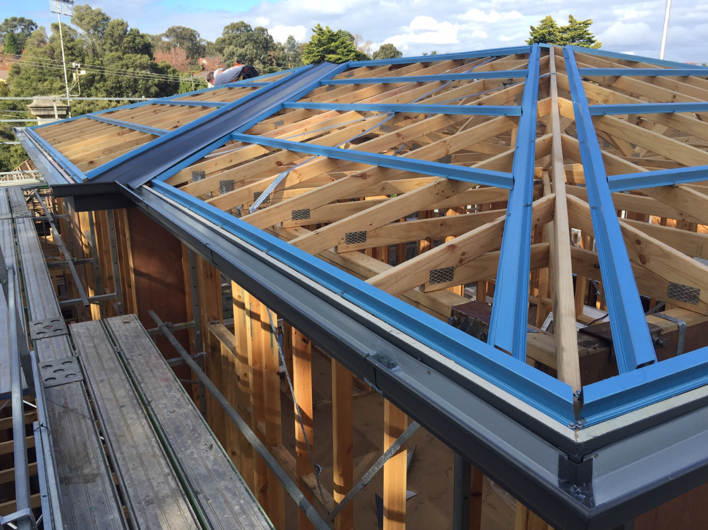 This minimises the pressure on your structure, making it the ideal material for unique roofing designs. Take a look at Southern Cross Station, or any of Melbourne’s many stadiums. You’ll notice that every single one of them has a weird, unconventional roof. You’ll also notice that each one solely uses metal roofing. That’s because metal roofing is easily the most flexible roofing material out there – figuratively and literally! Metal roofing is manufactured in relatively thin sheets. These sheets can be bent, curved and wrapped with relative ease, meaning that installing them on a weird roof design is relatively straightforward – try doing that with tiles! Tiled roofs have to be placed in such a way each row of tiles perfectly interlocks with the one below it, helping your roof stay in place. Not to mention, tiled roofs tend to require a lot more support owing to their weight (see above). In most cases, tiled roofs need a stronger structure to hold them up, as well as more criss-crossing rafters and beams. Needless to say, not all roofs have that! By contrast, metal roofing installation, metal sheets are cut to size and then attached directly to your roof structure using strong screws. Since metal roofing comes in sheets, it requires fewer beams and rafters to hold it up. Not to mention, the process itself is quick, simple and clean – exactly what you want for a more complex roof. Got a weird roof? Metal roofing installation might be just what you need! Whether your plan calls for a steep roof, a flat one or a curved one, metal roofing installation is hands-down the obvious choice. However, that isn’t the only choice you’ll need to make – you’ll also need to choose a metal roofing installer to perform the work. When it comes to metal roofing installation, you can’t go past Watermaster Roofing. What are you waiting for? Get in touch with our team today – call 1300 576 075, or click here to book in your consultation. How do metal roofing repairs protect you from unwanted house guests? Book an onsite inspection or give us a call to discuss roofing problems or your next roofing project. 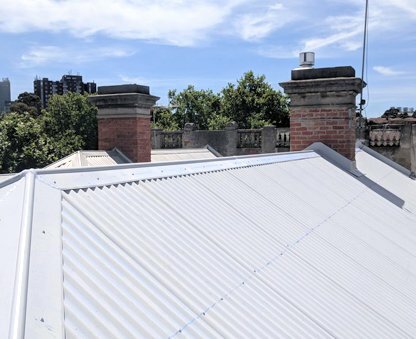 From minor repairs to complete restorations, Watermaster Roofing takes pride in providing high quality and durable metal roofing to commercial and residential properties across Melbourne. Organise an on-site inspection today!